Posted on Thu, Jan 19, 2012 : 6:47 p.m. 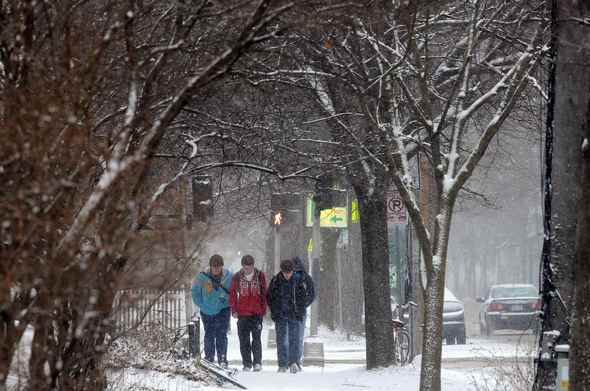 Teens brave the cold and snow as they walk along North Division Street in Ann Arbor Thursday. Let’s start with the good news. Friday’s morning commute should be a lot better than today’s. A low-pressure system headed for the Ann Arbor area won’t start dumping snow on Washtenaw County until mid-afternoon Friday. And there's the bad news: Friday’s evening rush hour could get ugly. Forecasters expect 1 to 2 inches of snow during the day Friday and another 2 to 4 inches Friday night. Forecasters’ best guess for a snowfall total is 4 inches for the Ann Arbor area, but it could range anywhere from 3 to 6 inches before it ends sometime around midnight. It only took about an inch of snow to turn the Thursday morning commute into a white-knuckle adventure. Dozens of crashes were reported on Ann Arbor-area roads and freeways Thursday morning. Weather observers recorded a snowfall total of 1.2 inches in Ann Arbor. Winter weather advisories for Friday are out for areas to our west, but forecasters will look at data overnight before deciding whether to issue one for Washtenaw County, said Bryan Tilley, a meteorologist with the National Weather Service in White Lake Township. The snow will likely end around midnight Friday, Tilley said. Before we get to the snow, we’ll have to endure a night of bone-chilling cold. Temperatures will drop into the single digits tonight with a low around 3 degrees expected and wind-chill values as low as 3 below zero. The cold will stay with us Friday with wind chills sometimes as low as minus 4 and a high temperature of 19 expected. Compared with the relative balmy conditions we’ve enjoyed for much of January and most of December, it’s bound to feel even worse. “This stretch of weather is reminding us that it is winter in Michigan," Tilley said. Fri, Jan 20, 2012 : 12:50 p.m.
Could be a slow end to restaurant week! Fri, Jan 20, 2012 : 3:26 p.m.
People do not go out in this cold and especially when snow is forecasted. Hope dinner isn't ruined over a little snow. Fri, Jan 20, 2012 : 4:30 a.m. Yes it is cold. It doesn't stop me from going outside. Sat, Jan 21, 2012 : 12:07 a.m. They say to go outside and walk to keep healthy. Must be the immune thing. Fri, Jan 20, 2012 : 3:41 a.m. If you want to be technical about it, Friday ends at midnite and Saturday starts at midnite. So it is what you want it to be. Who knows. Fri, Jan 20, 2012 : 4:14 a.m.
What is Noon and Midnight? A.M. and P.M. start immediately after Midnight and Noon (Midday) respectively. This means that 00:00 A.M. or 00:00 P.M. (or 12:00 A.M. and 12:00 P.M.) have no meaning. Every day starts precisely at midnight and A.M. starts immediately after that point in time e.g. 00:00:01 A.M.
Fri, Jan 20, 2012 : 2:44 a.m.
&quot;It only took about an inch of snow to turn the Thursday morning commute into a white-knuckle adventure. &quot; As usual, it was an &quot;adventure&quot; driving on untreated emergency routes mid-morning. Huge swaths of Washtenaw Ave, an emergency route, was not salted by 10 am. There is really no excuse for this. I am staying home tomorrow, that's for sure. The city of AA doesn't get it, period. I guess if AA only gets 3&quot; tomorrow the plows won't be fired up. The city website states that they only plow after 4&quot; has fallen (which is totally ludicrous), so get ready folks for another driving adventure tomorrow. During the day tomorrow, while people are slipping and sliding into each other all over the city, the snow plows will be sitting in their garages waiting for that magic 4&quot; to fall. Good luck! Sat, Jan 21, 2012 : 5:09 a.m. Since you won't be out tommorrow we can not count on your incorrect information. Yeah! Not enough salt, to much salt.. More brine equipment not enough equipment or workers.....who pays for this stuff? Not your CITY tax dolllars. You need to get a grip of how things work. Attend a city council meeting and ask questions would be a good start! Not everyones street can be first, someone has to be last. Dam.... what a concept. And there are laws and regulations that need to be followed, ...imagine that! You need to slow down, and drive for the weather conditions. You are the only one who can keep you safe.....to an extent.... sh@@ happens! Fri, Jan 20, 2012 : 2:42 a.m.
Fri, Jan 20, 2012 : 1:51 a.m. I refuse to slow down for the snow - or anything - because the driver behind me is driving too close and would hit me. Fri, Jan 20, 2012 : 2:04 a.m. In fact, I was hoping to be home hours ago but he's still too close. I'm not slowing down just so he can hit me. You could always pull over and let the person riding your tail pass you. Or you could do as the person behind you wants and speed up. Your call. I refuse to bend to some DB's will and I drive safely and at a speed I find comfortable for my ability. Fri, Jan 20, 2012 : 12:32 a.m. Thanks Cindy for asking what officers say is the biggest reason for all the accidents. NOT! You would not want to do anything that might result in fewer hits or actually go out of your way for a public service message! Thanks Anyway. Fri, Jan 20, 2012 : 12:14 a.m.
White knuckle adventure? It was a piece of cake for me. Just gotta get the rest off the street. Looks like we will get 3. Never more.